On Sale Now! Free Shipping Included! Save 5% on the TRENDnet 16-Channel 1080p HD Network Video Recorder, 2 SATA II Bays for up to 12 TB Storage, Easy Install, HDD, Rack Mount hardware included, ONVIF, IPv6 Compliant, TV-NVR2216 by TRENDnet at Tobby News. MPN: TV-NVR2216. Hurry! Limited time offer. Offer valid only while supplies last. TRENDnet’s standalone 16-Channel HD NVR, model TV-NVR2216, offers a comprehensive rack mountable video display, storage, and management solution. TRENDnet’s standalone 16-Channel HD NVR, model TV-NVR2216, offers a comprehensive rack mountable video display, storage, and management solution. The NVR networks up to sixteen cameras* and auto-recognizes TRENDnet models. Install up to 12 TB of storage (hard drives not included)** to record continuous or event-based video from sixteen HD cameras***. The TV-NVR2216 features advanced video playback with free iOS and Android apps. This 1080p HD NVR supports up to a 12 TB hard drive and networks up to eight network cameras-hard drive, cameras, and display sold separately. The NVR auto-recognizes TRENDnet cameras* - simply connect compatible TRENDnet cameras and start recording surveillance video. 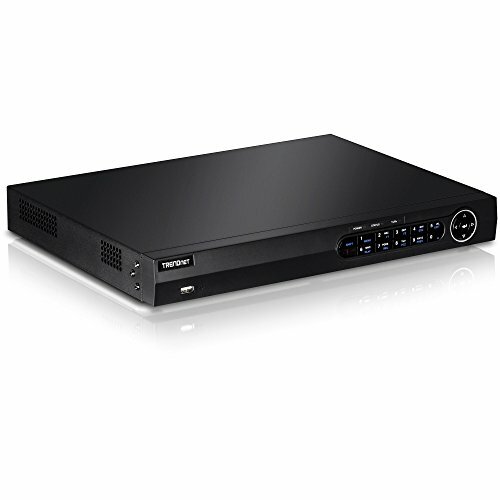 STANDARD 1080P HD NVR- TV-NVR2216 is a standard 16-channel 1080p HD NVR with two 3.5" SATA bays that support up to 12TB HDD/SSD of storage and powers up to sixteen network cameras (hard drive, cameras, and display sold separately). PLUG & PLAY INSTALLATION- TV-NVR2216 auto-recognizes and powers up to 16 TRENDnet cameras or cameras that are ONVIF Profile G and S compliant. Simply connect the compatible cameras and start recording surveillance video. RECORDING TIME- Record up to three weeks per camera with a 12TB HDD (sold separately) and sixteen 1080p cameras at 30 fps (medium VBR), or over one month of recording per camera with a 12TB HDD (sold separately) and sixteen 720p cameras at 30 fps (medium VBR). INTUITIVE MANAGEMENT INTERFACE- With an easy to use interface, quickly navigate live view preferences, recording schedules, advanced playback options, with dynamic DNS support (DDNS) and IPv6 support. User interface compatible with Internet Explorer 9.0 or higher, Safari 4.0 or higher. While the free TRENDnet app enables you to view live cameras remotely from your mobile device.